Do you have to walk on your hands in this house? Anyone with a little time to kill on the way to or from Incheon airport should head to Geokkuro Jip “Upside down house” for an unusual photo op. This curious upside down house was built by its owner and former clothing designer, 51-year-old Jeon Yong-sun, who designed the house himself. September 21, 2011 Posted by oldstersview | buildings, Strange	| Comments Off on Do you have to walk on your hands in this house? Is this the ugliest building in England? Some of the most beautiful buildings in the world are designed to be both sleek and eco-friendly. And then there’s the Strata Tower, which improves urban density and has three wind turbines. And it’s been named Britain’s ugliest new building. The Strata Tower won that questionable honor in an annual competition held by Building Design magazine. It’s the tallest residential building in London, standing at 480 feet, so it’s good from a density standpoint as well as having wind turbines. 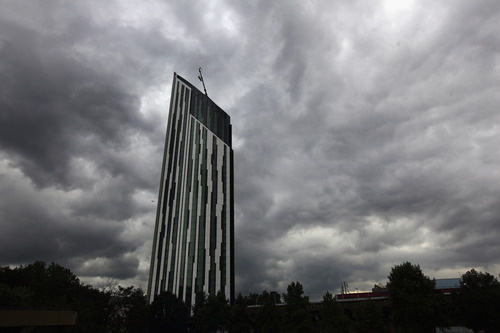 via Eco-friendly super-tower, “The Electric Razor,” is named ugliest new building in England. August 13, 2010 Posted by oldstersview | buildings, Great Things	| Comments Off on Is this the ugliest building in England?